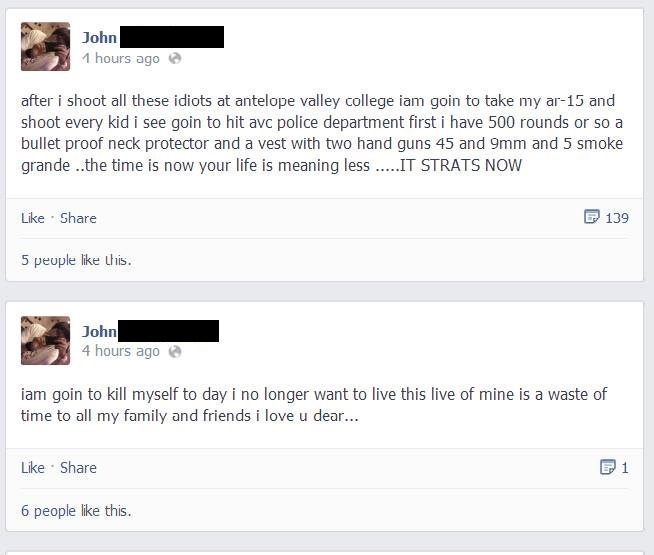 Today a friend found and reposted images of posts they pulled off of a Facebook profile where the person posting claimed they were planning to go on a shooting spree at Antelope Valley College. She included a link to the person’s profile to prove the images were legit. Sharing this info and the image was good to help notify friends going to that school, or that live in the area, so they could be aware. Unfortunately, I have no way to tell how many people called the Lancaster, CA police, but I was one of them. Granted, by the time I saw the Facebook post it was 5 hours AFTER the posted threats. On the phone I was informed by Lancaster PD that this person was in custody. Look at it this way… If it’s just a poor taste hoax, he needs to understand that it’s not funny and there are consequences for such actions. If it’s a genuine threat, then social media helped save many lives today and hopefully this person will be given the help they need.